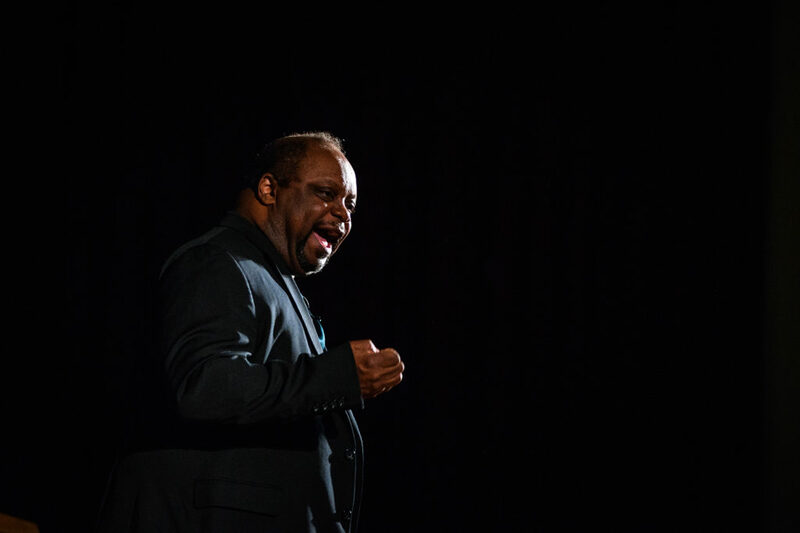 Ron Jones of Dialogues on Diversity, a social justice theater company, performs at Clark University for Martin Luther King Week. Ron Jones stood on the Atwood Hall stage at Clark University and became another man. The actor/lecturer assumed the persona of William, an African-American school custodian and father, who, on July 2, 1964, cradles his infant son and marvels aloud about the newly passed Civil Rights Act. “You’re going to have what your grandfather never had,” he assures his child. 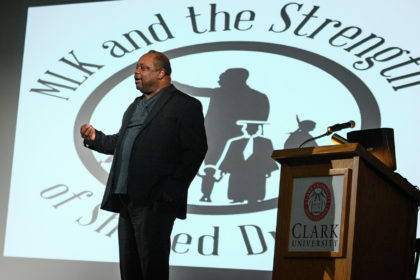 “Martin Luther King Jr. and the Strength of Shared Dreams,” featuring Ron Jones, was sponsored by Clark’s Office of Diversity and Inclusion. The movement exemplified King’s broadened mission of advocating for the rights of citizens across racial, ethnic, and gender lines — an amplified iteration of “woke,” a term King had employed as early as the 1950s. Jones noted that King invoked the legend of Rip Van Winkle to emphasize the need to become involved during moments of critical social change rather than remain oblivious to them. “There is nothing more tragic than to sleep through a revolution,” King said. “From its inception, this country is an exercise in trying to shore up the dignity of individuals,” he said. The movements toward achieving those rights have shown varying degrees of success. King’s brilliance, Jones said, was in the way he moved from “civil rights to human rights,” drafting wider swaths of people to the cause. Substantial change can take generations, he added, but King proved it is doable. “You have to massage people’s humanity,” he said. Jones said King’s bold example likely inspired later protest movements, like the gay men’s Stonewall protests of 1969, migrant farmers’ strikes, and the women’s liberation movement. Following Jones’ presentation, the audience engaged in a talk-back session moderated by Ousmane Power-Greene, associate professor of history, and heard closing remarks by Sheree Ohen, chief officer of diversity and inclusion. Esther Jones, associate provost and dean of the faculty, offered opening remarks. “Martin Luther King Jr. and the Strength of Shared Dreams” was sponsored by Clark’s Office of Diversity and Inclusion. The event was presented by Dialogues on Diversity, a social justice theater company.